SKU: USED EB575152YZ. You’ll need to choose that option at checkout. We have done our best to ensure the quality of your product. We have been an industry leader in wholesale cellular phones and accessories since 2005. I500 Fascinate. LIMITATION OF LIABILITY. OEM Samsung Battery Units. Fits Samsung Models. Doing so may greatly improve the over-all life of the Battery. NEWUnits in a Bulk Bag. Model No. EB 575152YZ. Capacity: 1500mAh. OEM Authentic Samsung Product. Samsung Part No. Accessory Only. Phone not included. OEM Samsung Fascinate SGH-I500 Standard Battery - 1500mAh. It includes an integrated micro-chip that prevents overcharging and extends battery life. Samsung Fascinate SCH-I500. includes an integrated micro-chip that prevents overcharging and extends battery life. Original Samsung EB575152YZ battery. This long lasting. Verizon Samsung Fascinate. TracFone Samsung Galaxy S Showcase. Verizon Samsung Showcase. It has been tested and works great! EB575152YZ, EB575152YZBSTD. MODELS-Samsung FASCINATE i500. THIS IS FOR ONE GENUINE, OEM SAMSUNG FASCINATE BATTERY. Double up on battery life at an affordable price with this Standard Battery. 100% OEM compatible. Software that has been opened will NOT be accepted. Check-Out Later?. Master Card. Genuine Verizon / Samsung 1,500mAh Standard Lithium-Ion Battery for Samsung Fascinate i500 Galaxy S Phone. 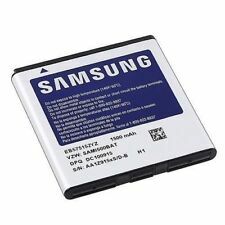 OEM Genuine Samsung battery ensures your cell phone works at optimum performance and reliability. New Genuine Verizon / Samsung 1,500mAh Standard Lithium-Ion Battery for Samsung Fascinate i500 Galaxy S Phone. 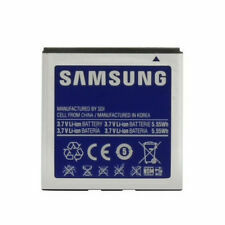 OEM Genuine Samsung battery ensures your cell phone works at optimum performance and reliability. Samsung Part No. Showcase i500. Fascinate SCH-i500. OEM Samsung Battery. ​​OEM Authentic Samsung Product. Litium-Ion Battery, 1500 mAh 3.7V 5.55Wh. IN GREAT WORKING CONDITION! FREE 'N QUICK SHIPPING! Samsung Showcase a Galaxy S I500 phone Android Smartphone Cell Phone. OEM Authentic Samsung Product. Samsung Part No. Accessory Only. Phone not included. You’ll need to choose that option at checkout. We have done our best to ensure the quality of your product. MPN: EB575152YZ. You’ll need to choose that option at checkout. We have done our best to ensure the quality of your product. We have been an industry leader in wholesale cellular phones and accessories since 2005. Samsung FascinateGalaxy S I500 phone Android Smartphone Cell Phone. OEM Authentic Samsung Product. Samsung Part No. Accessory Only. Phone not included.